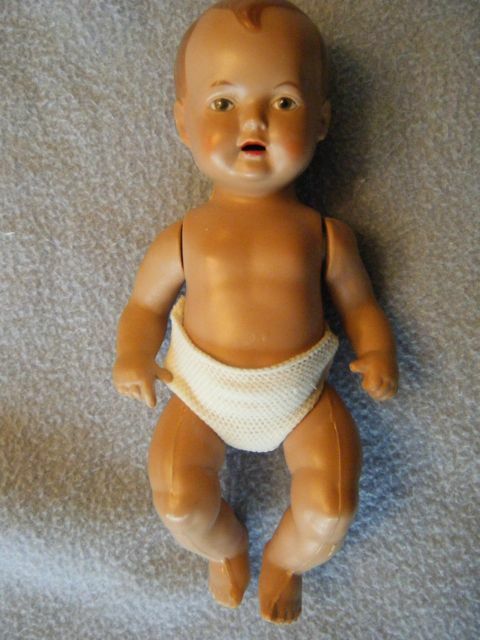 "Celluloid" Doll 2 - Schildkrot Reproduction? My sister acquired this doll from a local antique store. It was part of a display where a doll was holding this doll as a baby doll. The two dolls were not related, so my sister purchased this one separately. At first glance it appears to be "hard plastic". 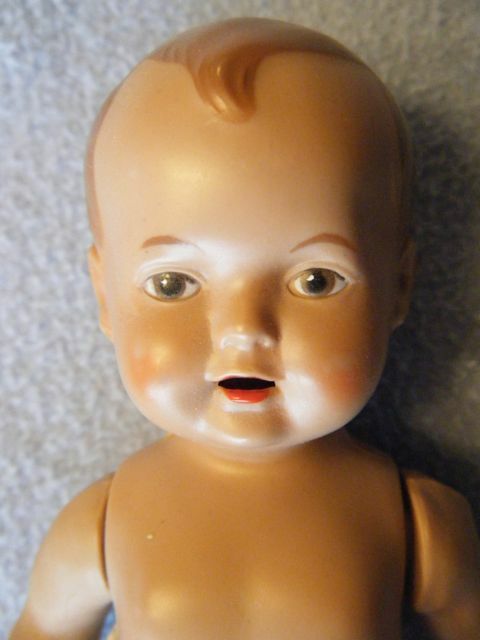 Studying the doll more closely makes one feel that it is actually celluloid. Further inspection shows it to be made from a material that is something in between celluloid and hard plastic. 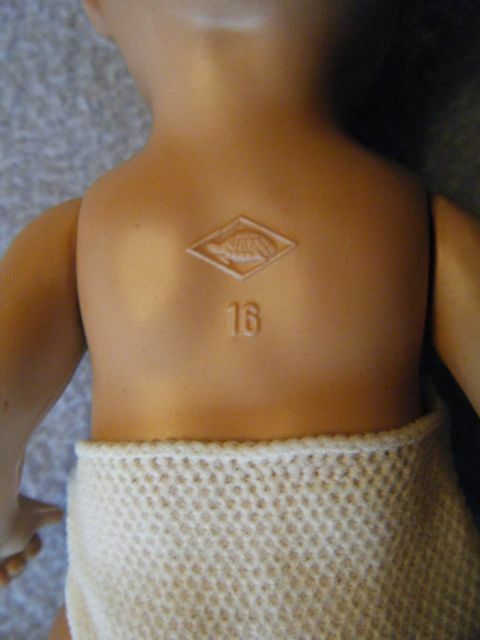 The doll mark on the back of the body is a turtle in a rhombus with the number 16 below. This is the mark of the German doll manufacturer Schildkrot (also Schildkroet). Pulling an arm out a little reveals modern elastic stringing. The doll could either be old and restrung - or more likely, a reproduction. The seams on the arms and legs are rather roughly done. If the doll is a Schildkrot reproduction it is made from a plastic known as tortulone, which is not flammable. Figure 1 - Front of the doll. The positioning of the seams make the doll look like celluloid. Figure 3 - Notice the detail in the eyes and the open mouth. The doll is pretty "thick" for celluloid. 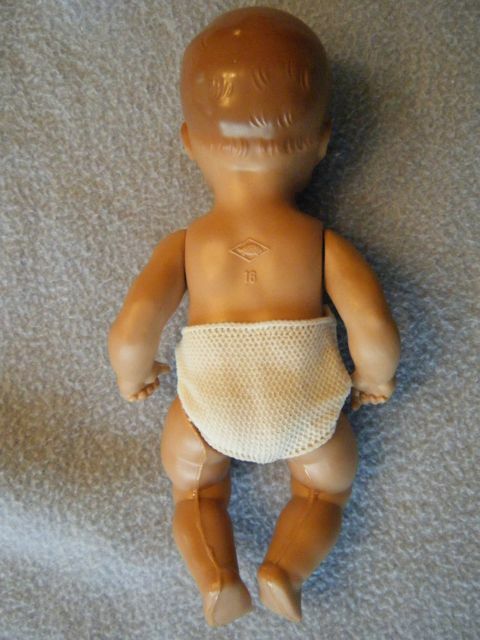 Figure 2 - Not sure if the diaper is original - it appears to be made from a modern synthetic mesh-like material. Figure 4 - The distinctive Schildkrot turtle in a rhombus.